A judge ordered Richard Maloney to wear a GPS tracker like the pone seen here to ensure that he stayed away from his wife’s home as he faced a domestic violence charge. When he violated the no-go order, the device triggered an alert, and he was re-arrested. Richard Maloney is a 48-year-old resident of Bunnell. Less than two weeks ago he was arrested on a domestic violence charge and two other charges: his wife accused him of holding her hostage and cutting her finger after he threw a potato peeler at her during an argument. It wasn’t the first time law enforcement had been at the couple’s house. On a previous occasion a police officer reported that Maloney made efforts to keep his wife from speaking with cops. Maloney’s wife had also sought to have an injunction against her husband. He denied hurting his wife. After some resistance, he was arrested and booked at the Flagler County jail. He was released the next morning on his own recognizance. But a judge imposed conditions on his pre-trial release: he was to have no contact with his wife, and he was to wear an electronic ankle monitor providing his GPS whereabouts at all times. The Flagler County Sheriff’s Office implemented the use of electronic monitors last November. It’s part of the various measures the agency implemented following recommendations by its domestic-violence task force, along with the Bunnell and Flagler Beach police departments. The monitors are meant to improve the safety of domestic violence victims by more effectively imposing a no-go zone for offenders (or alleged offenders), who typically are required to steer clear of their victims’ homes, places of work, school and other places where they may be. But domestic violence offenders are notorious for violating the terms of their pre-trial release, and for doing so largely on the assumption that no one will know where they go and when. Ankle monitors make that sort of deception much harder to pull off. Exclusion zones specific to an alleged offender are programmed in. If the offender violates that zone, the Sheriff’s Office is immediately notified with a so-called “exclusion alarm.” The devices can also be programmed to notify the victim through a phone app. That part of the system has yet to be implemented. The program was implemented through Securus Technologies at no direct cost to taxpayers. The police agencies don’t own the ankle monitors. “The inmate is required to agree to the terms and pay for the monitoring service directly to Securus,” a sheriff’s spokesperson said. “The offender pays $5.25 per day.” It may seem like a modest sum, but typically domestic violence suspects’ pre-trial period can stretch for weeks or months: in Maloney’s case, he was released on Jan. 28, but his arraignment wasn’t scheduled until Feb. 25. Just for that period of time he’d have had to pay $147, with likely more to pay in subsequent weeks if he remained in pre-trial release. In the event, he didn’t. Two minutes before 4 Monday morning, the sheriff’s communications center got an “exclusion alarm,” indicating that Maloney had traveled within the restricted zone of his home in Bunnell. The communications center then kept receiving pings, which Securus maps out on an actual map sent to the agency. Maloney lived in Grand Reserve, an entirely residential area a significant distance from stores and other businesses, so there would have been no reason for him to be there. Deputies tried to contact the alleged victim by phone and in person but were not successful, and concluded that the house may have been unoccupied. They eventually located Maloney at the Beachfront Motel in Flagler Beach. Maloney, according to his arrest report, admitted going by his house in Grand Reserve. He told deputies that he’d gone to Walmart, gotten gas, then “took the backway home,” according to the arrest report, traveling through his former neighborhood, even though it would have required him to go out of his way westward from Walmart and Belle Terre Parkway to do so, before turning back to head east, to Flagler Beach. Less than two hours before the violation, Maloney had called the sheriff’s office to request a civil standby–a permissible, one-time access to his house, under the supervision of law enforcement, to retrieve personal belongings. But domestic violence suspects are afforded only one such civil standby. Maloney had already used up his, his arrest report notes, so he was denied a second and told to follow up with his attorney (Matthew Maguire). At about 5 a.m., Maloney was placed under arrest again for violating his pre-trial release and taken back to the Flagler County jail, where he’s remained since, without bond. His pre-trial release was revoked. He was one of eight alleged offenders wearing the GPS ankle monitor, and the first to violate an exclusionary zone since the devices have been in use since November. “This is a perfect example of the process working as designed,” Staly said. 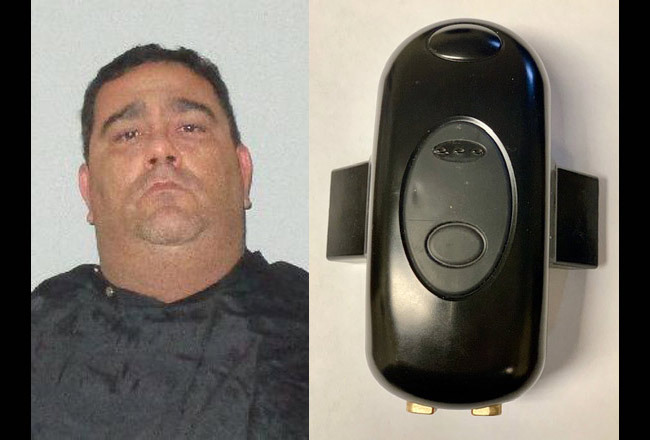 The very first offender to be fitted with the device was Matthew Harrison, a 28-year-old resident of Ormond Beach arrested on Peach Street in Bunnell the last day of October on charges of felony child abuse and domestic battery by strangulation. He abided by his pre-trial release requirements, the child abuse charge was dropped in exchange for a plea on the domestic violence charge. He was sentenced to two years’ probation. But two weeks ago he violated probation by smoking marijuana. His probation officer recommended that no action be taken against him, as it was a first violation, and Harrison was seeking to obtain a medical-marijuana card. An ankle monitor is no longer attached to him. Pretrial release is another name for probation while one is still presumed innocent. Many will applaud this travesty. I’ve had 80 year old men sleeping in their cars because they couldn’t return home. Allegations were brought by a drug addicted 25 year old grandson who was freeloading off of his grandfather. One of the most pathetic things I’ve ever seen. Grandson lived it up while the old man slept in the cold. Great job guys. We’re gettng closer and closer to a police state. I tried to live down my mistakes, by changing. Smoking pot is legal so many places, its wrong to put pot smokers back in with violent career criminals. They wont come out better. No children involved, but I broke my BFs nose once, he called me a name after years of supporting his situation. People do snap under certain conditions, doesnt mean Im a felon type or repeater. I agree, police make some terrible mistakes, no consequences, ever. A friends son, got Battery on a LEO, he was arrested on the beach. Sand got in one of the officers eyes- that was all it took. These things actually do happen. I was just thinking this as well, he’s made to be guilty until prove innocent. Wearing a monitor and paying for it too. The sheep will say that they’re are doing a good think but it’s time to wake up here people. It’s on the county and city councils for not getting with the times, and the will of the people, by not voting to decriminalize as many of our neighbors have done. They allow this to continue. Arresting pot smokers serves no purpose and costs more money than it brings in. Technology is amazing and evolving in ways not thought of 20 years ago.